I liked the movie, so I decided to make this bento box even if there was no request for it. hehe I think Angelina Jolie in this movie was stunning beautiful!!! 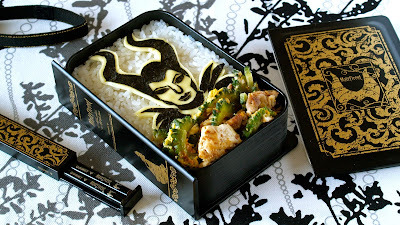 I happened to find the "Maleficent bento box" online. It was well made and gorgeous. Dishwasher safe & microwavable!!! Nice and calm black color is perfect for Japanese-style bento for every day use. Worth to buy quality!!! 1. Draw Maleficent on a piece of paper. 3. Place Nori seaweed sheet on a flexible cutting board. Then place the parchment paper on top. Secure them with paper clips. 4. Cut out the image with a design knife. Make sure you don't lose any of the parts you cut out (keep them in a box). 5. Place them on a sliced cheese.